The following includes SPOILERS for the Doctor Who season 4 episode 11, “Turn Left”. Doctor Who Magazine (DWM) is an awesome monthly publication. If you are a who fan, it’s definitely worth buying this magazine. Issue #397 hit the stands after the airing of “Turn Left”, but before the airing of “The Stolen Earth”. So this issue hit at the moment of ultimate hype for season 4. We only got it here in the states last week. 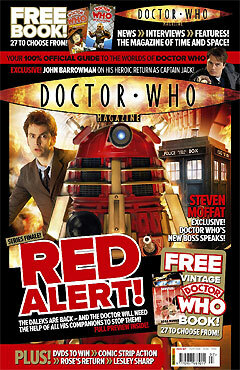 The team at DWM gets lots of insider information on the show and they planned this issue to capitalize on the hype. The issue came polybagged, with a vintage Doctor Who book free. This was one of the Target novelisations of the old series. I happened to get “Galaxy Four” in my polybag. Pretty cool. The amazing thing was what you saw after you removed the polybag. Remember the end of “Turn Left”? Donna tells the Doctor what Rose said in the parallel universe, “Bad Wolf”. 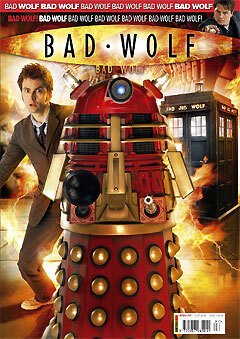 The Doctor runs outside and every sign has changed into the words “Bad Wolf”, even the TARDIS exterior. Well check out these images below. The first image is the magazine cover still in its polybag; pretty standard magazine promo copy. The second image is the magazine cover after you remove the polybag. Notice the care to keep the same fonts and everything. Awesome! I may have to pick up that issue. Just for the free book alone.